This essay focuses on one of Chopin's most enigmatic pieces—the Etude in E Major, op. 10, no. 3—and it describes my efforts to come to terms with the compositional problems that I once perceived in it. To be precise: when I first analyzed the score, I discovered a structure that appeared to lack coherence, and this reinforced my sense that many performances of the work fail to hang together. My doubts about the music's coherence seemed hard to justify, not least because the Etude is generally regarded as one of Chopin's masterpieces. I therefore began to seek alternative ways of understanding the music, a process lasting many years. The work has a simple tripartite form, shown in figure 8.1, with an initial A section giving rise to a longer B section, followed by a varied reprise of the opening. The expressive innocence of the main theme in section A is eventually overshadowed by an eruption in the middle of the Etude that seems almost uncontainable, so great are its tensions. But these are gradually defused in a transitional passage leading to the return of the opening theme, and the coda at the end of the piece similarly dissipates lingering tensions from local and global climax points. Jim Samson has observed that the second section of the ABAʹ form is exactly twice as long as the first—82 versus 41 quarter-note beats—and that the central climax comes at a point proportionally equivalent to the smaller-scale one in the first A section, after 66 beats versus 33, with the sixteen-beat transitional passage that I have referred to corresponding in length and, to some extent, in function to section A's last four measures (that is, eight beats; see fig. 8.2). These intriguing relationships are not typical of Chopin, who was no mathematician when it came to the durations and effects of his musical forms; nevertheless, in the Etude, he used a strongly proportioned framework as one of the ways to shape the music into a single broad gesture, the performance implications of which will be drawn out later. 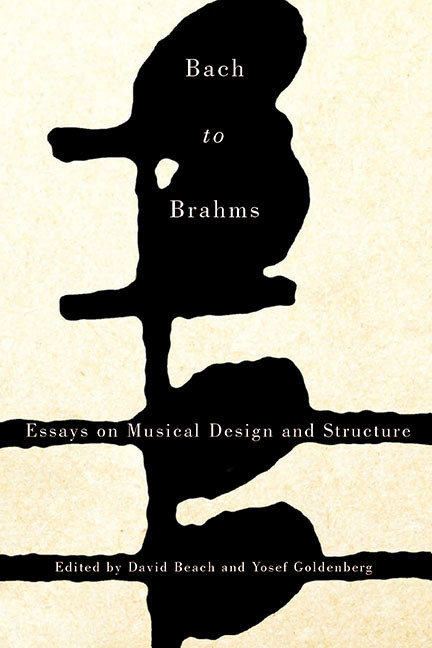 Bach to Brahms presents current analytic views by established scholars of the traditional tonal repertoire, with essays on works by Bach, Handel, Haydn, Mozart, Beethoven, Schubert, Chopin, and Brahms. The fifteen essays are divided into three groups, two of which focus primarily on the interaction of elements of musical design (formal, metric, and tonal organization) and voice leading at multiple levels of structure. The third group of essays focusses on the 'motive' from different perspectives. The result is a volume of integrated studies on the music of the common-practice period, a body of music that remains at the core of modern concert and classroom repertoire. Contributors: Eytan Agmon, David Beach, Charles Burkhart, L. Poundie Burstein, Yosef Goldenberg, Timothy Jackson, William Kinderman, Joel Lester, Boyd Pomeroy, John Rink, Frank Samarotto, Lauri Suurpää, Naphtali Wagner, Eric Wen, Channan Willner. David Beach is professor emeritus and former dean of the Faculty of Music, University of Toronto. Recent publications include Advanced Schenkerian Analysis, and Analysis of 18th- and 19th-Century Musical Works in the Classical Tradition (co-authored with Ryan McClelland). Yosef Goldenberg teaches at the Hebrew University of Jerusalem and at the Jerusalem Academy of Music and Dance, where he also serves as head librarian. He is the author of Prolongation of Seventh Chords in Tonal Music (Edwin Mellen Press, 2008) and published in leading journals on music theory and on Israeli music. From the cylinder to the download, the practice of music has been radically transformed by the development of recording and playback technologies. This Companion provides a detailed overview of the transformation, encompassing both classical and popular music. Topics covered include the history of recording technology and the businesses built on it; the impact of recording on performance styles; studio practices, viewed from the perspectives of performer, producer and engineer; and approaches to the study of recordings. The main chapters are interspersed by 'short takes' - short contributions by different practitioners, ranging from classical or pop producers and performers to record collectors. 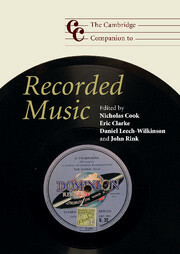 Combining basic information with a variety of perspectives on records and recordings, this book will appeal not only to students in a range of subjects from music to the media, but also to general readers interested in a fundamental yet insufficiently understood dimension of musical culture. The Cambridge Companion to Recorded Music is a very broad title. On one interpretation it might take in just about all popular music, the development of which was largely conditioned by recording; on another you might expect an annotated guide to the recorded repertory. We are offering neither of these. Our aim is rather to promote an understanding of the ways in which recording has both reflected and shaped music throughout the twentieth century and into the twenty-first: that is, how it has reflected and shaped not just the music itself, but the ways in which it is produced and the ways in which it is heard. That involves a lot of background information about recording and recordings, which we also try to cover. And ‘music’ in this context is a very inclusive term, encompassing the countless different genres of classical and popular music, all of which have been shaped by the development of recording technologies, originally in North America and Europe, and their subsequent spread across the globe. The way in which music has been shaped by recording is not uniform, however, and comparison of the impact of recording on different classical and popular traditions brings home the variety of conceptions that exists of what recorded music is and might be. The appearance of this Companion is a symptom of – and, we hope, will further contribute to – the increasing interest of musicologists in music as performance. To someone outside musicology it might be odd to think of it as anything else, but the traditional focus on scores as the repositories of compositional creativity has led musicologists to think of performance as something that happens after the event, so to speak, rather than being a creative practice in its own right. It also signals the discipline’s increasing concern with reception, with the way in which music is given meaning in the act of listening to it, and in the other acts that are informed by listening, ranging from dancing to it to writing about it: recording has fundamentally changed the reception of music, in terms of its nature, its conditions, the places where it happens. This chapter investigates the psychological processes by which human beings make sense of, respond to, and create music. It starts by defining the term “psychology”; it then surveys the history of music psychology, and describes where and how it is currently practiced. A section on the main methods used by music psychologists follows, with numerous case studies drawn from recent literature. This leads to extended consideration of what the “musical mind” entails and how it functions in relation to the body. Further case-study examples are offered here and in the discussion of how we learn music. The section on musical creativity looks in particular at improvisation, while the final part of the chapter considers musical expression and how we perceive it. Topics addressed in the course of the chapter include the “talent myth,” sight-reading, and the various types of musical memory and skill as well as the means by which skill and expertise are developed. Emphasis is continually placed on the role of experience and acquired knowledge in interpreting the world around us. What is the psychology of music? What do music psychologists do? How does “the musical mind” work? How do we create music? What is expressed in music and how do we perceive it? 2) run to the door?